The animation sequences are transformed to meet the animator's objectives while preserving the dynamic physical properties of the original motion. All dynamics computations are performed on the simplified representation of the character. The input motion sequence is transformed with the minimal number of intuitive modifications. Each transformation is shown both on the simplified and the complete animated character. Each transformed motion has 2 animations. The first one represents the transformed spacetime solution of the simplified character, while the other shows the final transformed motion of the complex character. QuickTime animations denoted with [QT] are rendered at 320x240 and compressed by the Sorenson codec (some older QuickTime players may not support this codec). The animations labeled with [qt] are rendered at 160x120 and compressed with the Cinepak codec (coming soon). You can download the Quicktime player from Apple's QuickTime page. 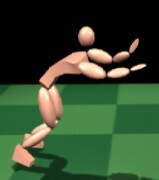 A captured motion sequence of a human broad jump, is transformed to produce a collection of animations. [QT] Captured motion of a human broad jump. Input sequence. For more details on the motion capture process see my mocap page. We moved the landing position to the side and constrained the torso orientation to point straight ahead at all times. This change realigned the push-off and anticipation stages in the direction of the jump. Since the jump length was increased, the entire resulting motion looks more impulsive. [QT] Raised Destination with a Hurdle. We raised the landing position and introduced the hurdle which forces raising of the legs during the flight stage. As a result, the character push-off is more vertical, and the legs tuck in during the flight. We removed the final pose constraints that impose the upright position. In the resulting sequence, the character never uses its muscles to stand up upon landing since this would add unnecessary non-smoothness of the muscles. Instead of straightening up the character tumbles forward giving the appearance of poor landing balance. Final torso orientation at the end of the animation has been changed to indicate the 90 degree turn. The transformed motion of a human broad jump shows twisting of the body before takeoff and during the flight phase. Note that landing looks markedly different from the input sequence. This example takes a human running sequence and transforms it into a collection of different animations by changing the physical properties of the environment, footprint placements and even the character structure. Captured motion of a human run. We repositioned the foot print mechanical constraints wider apart so that the character would have to move significantly farther to the side at each step. We kept the constraint timings unchanged. But, since each step now covered more distance the overall resulting motion has leaps of smaller height. We moved foot prints to the opposite side of the body, forcing the character to twist at each step. We also introduced the "slippery floor" objective component, which penalized the component of the floor reaction forces in the floor plane. In order to create a human run sequence on the moon, we reduced the gravity constant down to 1.6 m/s2 ,and we allowed for more time to elapse by applying a global time warp. The resulting run was slower and had much higher leaps. We also increased the Earth�s gravity by tenfold to see how the running sequence would adjust to such extreme gravitational field. The resulting flight phase of the run was so low to the ground that the running character had the appearance of speed walking. We removed the left knee DOF, creating the appearance of the entire leg being put in a cast. We also reduced the duration of the left footstep mechanical constraint, while we increased the duration of the right footstep. 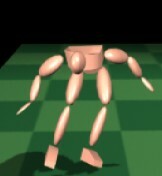 As a result, The character leans to the side and swings the right leg in a more dramatic fashion, creating a realistic (albeit painful) limp run. In order to test the limits of the drastic character model modifications, we shortened the shin of the right leg, as well as fixed the left knee DOF as in the limp run. The output running sequence now has an extreme limp, with the leg in the cast swinging more to the side due to the shorter right leg. The motion has an extreme lean towards the shorter leg. The motion maintains the dynamic balance by significantly increasing the push-off forces of the shortened leg.